The Fox Terrier is a feisty, fun-loving dog who makes a great companion in the right family situation. If you're looking for more than a lap dog and don't mind a challenge, maybe this is the breed for you. Fox Terriers come in Wire and Smooth varieties. The Wire Fox Terrier's head has a very distinct look. According to the American Kennel Club standard, it should measure between 7 to 7 1/4 inches from the back of the occipital bone to the nostrils. 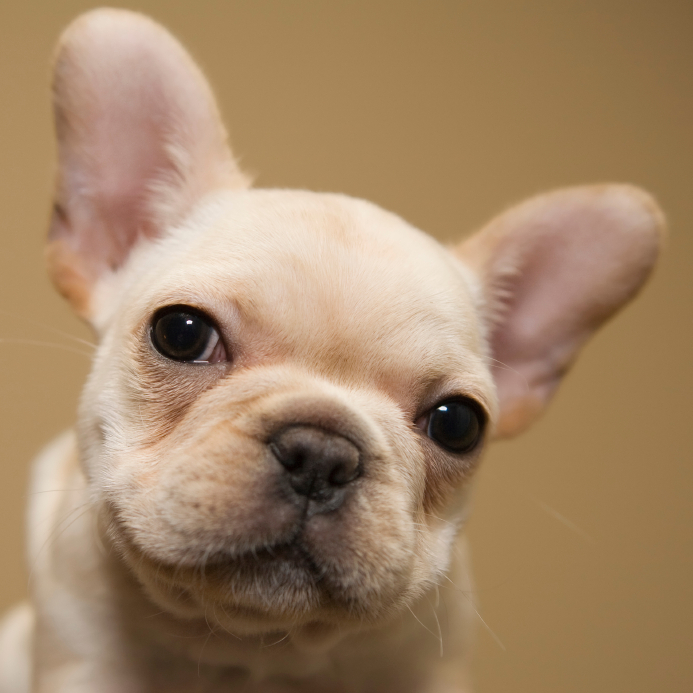 The ears should fold over into a v-shaped flap, and the eyes should convey a keen expression. If you don't enjoy a lot of grooming but love the feisty terrier personality, the Smooth Fox Terrier may be the dog for you. They're the same size and coloring as the Wire type but with a short, silky coat and their head is slightly more v-shaped than the Wire Fox Terrier's. Smooth Fox Terriers and Wire Fox Terriers are both known for being amusing, clownish companions with a feisty attitude. The smooth variety is known as the "gentleman of the terrier world" for their bold yet charming personality. If you love the look of the Smooth Fox Terrier and their temperament, but need a smaller dog, the Toy Fox Terrier is your best bet. These dogs are smaller versions of the Smooth Fox Terrier with some Italian Greyhound, Miniature Pinscher and Chihuahua mixed in. They make funny little lap dogs who enjoy playing as much as snuggling. Fox Terriers are bold, fearless, and always up for an adventure. On land or in the water, they have nearly unlimited energy. Their boundless energy makes them a great breed for people with active lifestyles. All of that energy needs an outlet, so Fox Terriers need a good deal of exercise. Games like Frisbee and fetch provide positive ways to burn excess energy which otherwise might be channeled into less desirable activities like digging and chewing. These terriers were originally bred to drive foxes out of their dens, and they still retain a high prey drive to this day. If your dog is outside and a small animal catches his eye, he could take off in a flash to chase it down. This is true even for tiny Toy Fox Terriers. This terrier's keen intelligence and natural speed are perfect for the sport of agility all sizes of Fox Terriers can be found in competition. Be sure to train your pet with positive reinforcement, and he will quickly learn to make his way through each station of the course. Fox Terriers love a good romp in the snow. Just keep in mind, you shouldn't keep these dogs outside full time, especially during the winter. Wire Fox Terriers require more grooming than the Smooth Fox Terrier and Toy Fox Terrier. Excess hair is usually removed from the coat using a stripping comb, especially on show dogs. However, some owners find it easier to groom their pets by using clippers to cut the coat back to a neater length. Whether you choose the wire or smooth type, Fox Terrier puppies are absolutely adorable, but don't let their funny antics deter you from training classes. These dogs require early and frequent socialization to help them adjust around other dogs, and the sooner you start teaching a terrier - any terrier - manners, the happier you'll be when the dog reaches adolescence. If you're willing to train and socialize your Fox Terrier, provide plenty of exercise, and keep him well groomed, he'll make an affectionate and entertaining pet for your entire family. Consider the breed when you're looking for a new family dog.